After almost a decade of being together and 17 months of marriage, Brad Pitt and Angeline Jolie are heading splitsville according to online gossip magazine, In Touch Weekly. A close friend of Pitt and Jolie said that the couple was already 'done'. Brad Pitt is assumed to file the divorce around February this year while he's in LA to film a new movie and Jolie is in Cambodia to direct 'First They Killed My Father'. 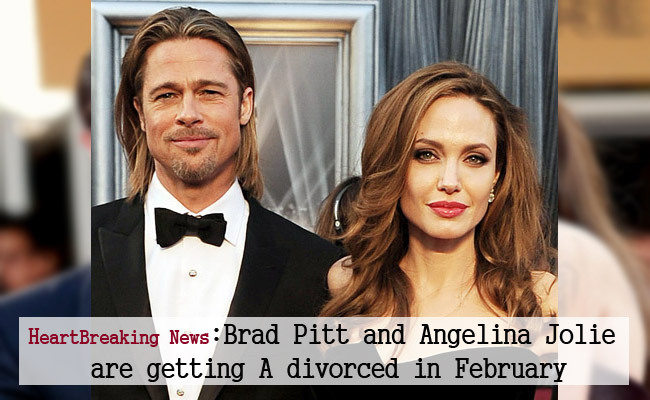 Pitt is even ready to move on to the next phase of his life without Angelina, the source added. Tons of workload, insufficient time together and falling out of love are the presumed reasons of the divorce. Though the couple are on their separate ways, they plan to maintain a civil relationship for their 6 children -Maddox (14), Pax (12), Zahara (11), Shiloh (9), and twins Knox and Vivienne, (7). Having said that, Pitt and Jolie will still celebrate holidays and special occasions together for their offsprings' sake. The source also said that the divorce would no longer surprise their children because it has been a while since Pitt and Jolie live individually. They are just making it official once the divorce has been filed. It looks like filming 'By the Sea' did not really help to save their marriage after all. Jolie said in an interview that working with Pitt was dangerous but they still did to 'test' their relationship and they [apparently not] succeeded. Angelina Jolie directed 'By the Sea' and starred it with Brad Pitt. When 2016 entered, paparazzi already had speculated that Bragelina are having marital difficulties. While these rumors of divorce are spreading like wildfire, Brangelina are still going to London this Spring to make time for their kids and will probably stay there for atleast 6 months. Brad Pitt is set to film World War Z 2 while Angelina Jolie will focus more to her advocacies related to Syrian crisis after she finished her directorial projects.